In mid-December I gave up playing Star Wars the Old Republic, and gave Lord of the Rings Online a new try. I had actually signed up for the game when it was new, and was so excited about it I paid for a lifetime subscription. But I never really got beyond the starting phase. Partly I was disappointed there was no player housing, as this was what I was most excited about in Star Wars Galaxies at the time. But, many years later, SWG was gone, and SWTOR seemed to have run its course. There was nothing to do at the top level, and even the addition of five new levels with the Makeb expansion wasn’t all that interesting. One place where where SWTOR really failed next to SWG was the annual Life Day event. There was lots to do in SWG, but this last Christmas all SWTOR offered was throwing snowballs on the space stations. In five minutes it was over for the year. 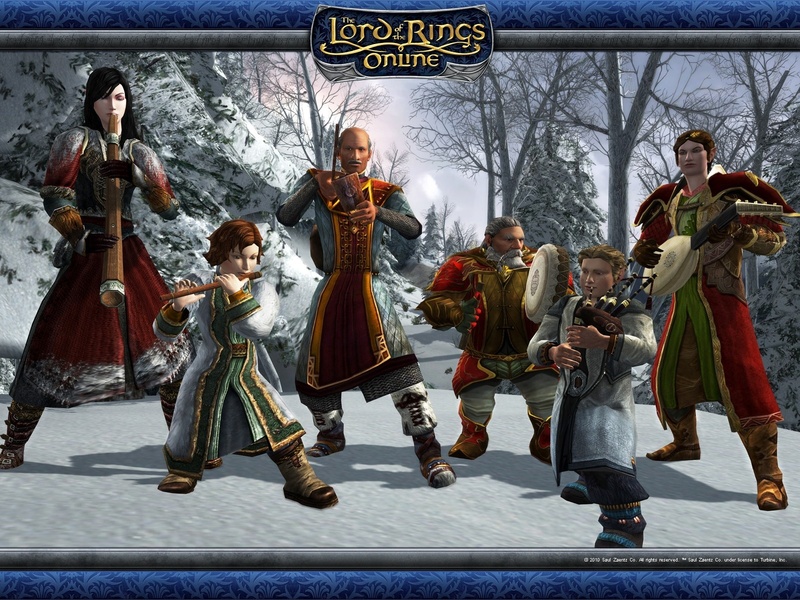 But Lord of the Rings Online offered a Yule Festival that was as fun as Livfe Day in SWG. As in any game, levelling up is quick at the beginning, so it was just a day or two before I was at a level when I could travel to Winterhome, where the Yule Festival was underway. It took a while to understand what the various events required, but once I worked it out, I went back daily. The events helped me level up more, and in between I went back to the rest of the game and worked on my quest line. There were a couple of Yule tasks that involved level 10 fighting, which meant that in the beginning I had to be very careful. After a few days, of course, it got a lot easier as my level went beyond 10. I was kind of sad when the event went away and I had to return to the rest of Middle Earth. One thing that is nice about LOTRO is that since it doesn’t have all the special cut scenes with actors’ voices used in SWTOR, it can be expanded easily, where a SWTOR expansion is a major (and expensive) project. Many of the NPC voice recordings in LOTRO are used over and over again, which doesn’t hurt the game, and must have made expansion much easier. Best of all there was player housing, which I signed up for as soon as I hit the right level. This is nice, but sadly nowhere near as good as in SWG. In that game, my home was where I started from every day, decorated the way I wanted, and filled with crafting machines and vendors for making and selling my goods in the game. It was a place to hang-out, yet with easy enough access to every place in the game, as there was a shuttleport right outside. The house in LOTRO is nowhere near as useful. I have found crafting in the game confusing, but even if I was into it, my house wouldn’t play a role. And it is too off the beaten track, there is no reason to return there very often, and not usually convenient for returning to where I need to be. Instead I log out and back in again wherever my quest line has taken me. And decorating is a disappointment. While in SWG you could drop any item in the game into a house, and rotate and move it in all three dimensions, to create all kinds of effects, in LOTRO there is a limited number of house decorations that can only be put onto specific surfaces. A “small wall” decoration” goes onto a “small wall” and nowhere else. And nothing else goes onto that wall. But that isn’t my biggest disappointment with LOTRO. There is a system of “Turbine points” and “mithril coins” that basically rips off the players. The basic game is free to play, and there is also a monthly subscription that gives you a bunch of perks (which is what I signed up for, as for some reason my “lifetime” subscription had disappeared). You earn gold and silver coins in the game, but to do certain things you need “mithril” and to buy mithril you need to go to the online store and buy it with “Turbine points”. You do get a handful of these points as you play, but nowhere near enough to buy the coins. So you have to buy the points for real money, then use the points to buy the coins. And this can add up. What do you need the coins for? The basic need is for rapid travel on your quests. When you are supposed to go see someone, you can pay 1 mithril coin to do it immediately. This isn’t much, and certainly often a lot easier than trekking for up to an hour through masses of enemies to get there (although you can do this if you wish). That isn’t a problem. What I object to is what happens when you get knocked out in battle. You are offered the option of “retreating” for free or reviving on the spot, free the first time, but then for 15 mithril coins (15 times a simple journey). Whereas in SWTOR the retreat option just moves you a short distance from where you were, in LOTRO this can put you up to an hour’s journey away, with a lot of slogging to get back. The problem with the revival is that this pops you up, in a very weakened state, exactly where you were, next to the enemy who killed you. So you immediately get killed again. This entry was posted on March 29, 2014 at 11:45 AM and is filed under Online games, The Old Republic. You can follow any responses to this entry through the RSS 2.0 feed. You can leave a response, or trackback from your own site.